Construction of walls at McKanna-Sandrock Retreat Center. 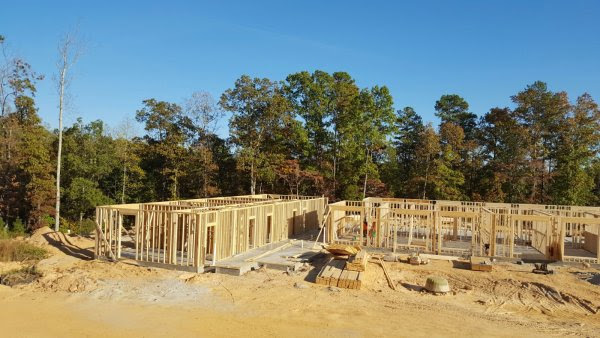 Walls are going up on the new McKanna-Sandrock Retreat Center as illustrated above. Already the new entrance road has been installed, the water and power are in place and work recently began on the sewage system. The projection is for the new retreat center to be completed by April 1, 2017. Funds are also in place to install the entrance archway to the Stender Campus and to build a Community Dynamics/Group Interaction low ropes course. Volunteers are being sought to assist with construction. Keith Johnson, Executive Director, recently announced that applications are open for the Lutheranch Site Director position with the plan for the director to begin by May 1, 2017. Two weeks of summer camp are scheduled for June 18-23 (confirmands and middle school youth) and June 25-30 (grade school youth). Registrations will soon be open online at www.novusway.com. Johnson went on to say that just $435,000 is needed in special gifts to fully fund construction. Several naming opportunities are still available. A gift of $30,000 will name a room and a gift of $15,000 will name contents for a room. If you would like to help “Complete the Dream” for Lutheranch, contact Keith Trout at ktrout@novusway.com or call 864-313-1453.